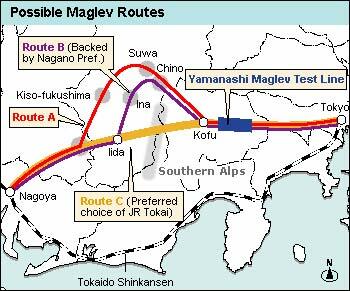 The progress is as a result of the government approving three possible routes between Tokyo and Nagoya for Japan Railway’s experimental maglev trains that can hit speeds of around 500kph (310mph) [Subscription link]. Choosing a route is a sensitive issue due to environmental disruption, building costs and economic benefits it can bring to areas with new major stations. The technology, on the other hand, is already in the bag. Maglev trains, as the name suggests, levitate on powerful magnetic fields above the tracks. The lack of friction means they can reach extremely high speeds. Rather astonishingly for anyone used to most Western trains, the Japanese technology has been in the pipeline since the 1960s, with a major publically viewable 20km test track to the west of Tokyo since 1997. The top speed reached so far at the Yamanashi test facility is 581kph (361mph). If that’s hard to picture, imagine a commercial jet aircraft flying past at full throttle at ground level – that’s in the same ballpark. Still, we mustn’t get too excited – the Japanese say they won’t be ready to put a maglev train into service at those speeds until 2025 at the earliest and that’s at a cost of around ¥5 trillion ($50 billion). Sponsored links: Our complete set of 642-447 dumps test questions and comptia network+ study guides you in exact way so you will pass your real brain dumps exam & icnd with flying colors of 350-029.